NYC Smile Design - BLOG - Your Toothbrush Making You Sick? Did you know that your toothbrush can harbor 100 million bacteria? Some of these bacteria are damaging and can contribute to the development of cavities, and if your toothbrush is harboring bacteria like staphylococci, you might be susceptible to skin infections. No need to panic- your mouth was not exactly sterile, which is why you need the toothbrush in the first place. For all intentions and purposes, your toothbrush is a great asset. The routine hygiene that you are encouraged to practice keeps your mouth free of harmful bacteria and plaque, which might otherwise cause havoc to your oral health- not to mention those around you if you developed bad breath. 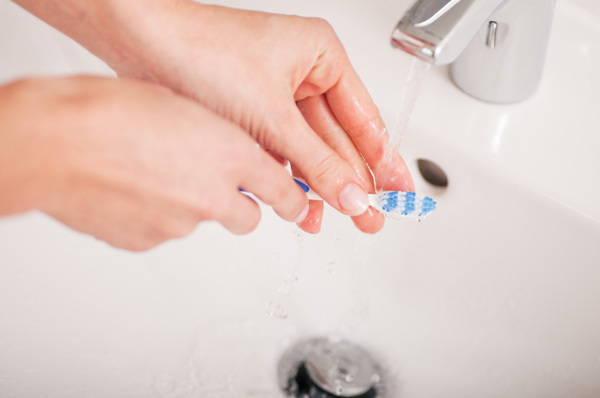 However, it important to take precautions to make sure that your toothbrush does not accumulate bacteria that might be harmful to your overall health. The first important step to take is to make sure that your toothbrush is not stored near where you flush. Yuck!!! If your bathroom is small, it is advisable that you store your toothbrush elsewhere. Every time you flush your toilet, bacteria are sprayed in the air and your toothbrush with its bristles becomes a resting place for these bacteria. 1. Thoroughly clean your toothbrush after every use. 2. Keep your toothbrush dry at all times. This means that when traveling; do not keep your toothbrush in a bag, or using toothbrush covers. You want to avoid creating a moist breeding ground for bacteria. No matter how close you are to someone, do not share a toothbrush. It is advisable not to keep the toothbrush side by side as this creates an opportunity for swapping germs. 4. Dip your toothbrush in Listerine to disinfect, but do not rinse with it, as there are better options for mouth rinses. On a closing note, make sure that you replace your toothbrush frequently. After every three months, you should be replacing your toothbrush. However, if you are sick, or you have a weak immune system, please replace your toothbrush more often than the advised three months.